A member of IBN for nearly four years now, business partners Daniel McLeod and Josh Beer, have grown into a powerful force in the flourishing region of the Sunraysia capital, Mildura. Of course it’s not just a joint effort with a dynamic and exuberant on site and off site team making the UBS journey such a successful one indeed. Joining the business partners are a hardworking and fun duo in Lindsay and Chantelle handling sales and administration. And out in the field, the awesome team of Jack, Hamish, Jordan, Josh, Mitch, Dean and Damon ensure all homes are built with the highest of regard for each and every client. To help grow the profile and showcase USB’s magnificent work they recently opened their first display home and showcasing the exciting new Murray design. In what we can safely say, the best ever IBN Member launch of a new display saw well over 300-people attend the first day on a typically sunny February Saturday and reports have told us that since that day there’s been well over 1,000 people through the door and the feedback has been tremendous - complimenting the quality of the build as well as the styling. Already several orders have come through on this particular design which is a testament to the layout of the home which was adapted from the IBN Linne design and customised to suit the astute Sunraysia market better. The new Murray floor plan even comes with its own Wine Cellar that is definitely the talking point of the home. Whilst the display home has been a massive success with many more contracts signed on other homes, it is not a sole promotion with Daniel and Josh’s efforts supplementing their marketing mix with local sports sponsorships, continual brand awareness promotions through the press, radio and a solid social media exposure that is a leading light for fellow IBN Members which saw UBS take out a National Award with the Network last year at the National Conference held on the Gold Coast. It is great to see a big success story in Mildura and surrounding towns with our Sunraysia Members and we compliment and acknowledge the hard work from all of the team at Ultimate Building Solutions. Congratulation to the crew from Ultimate Building Solutions! Trent, Garry and Red from TNC Homes are worthy recipients for the Builder of the month for their strong support of IBN and enthusiasm to “Make it Happen”. Some members will remember Trent and Garry as they were previously building for a community organisation affiliated with IBN. Now they have gone out on their own under the TNC Homes banner and have multiple builds underway. The team at TNC Homes joined IBN as one of the first investments into their business so they have the resources to compete with the larger builders in the greater Brisbane area. It is always a pleasure to have the TNC team at zone meetings and Professional Development days as they are always willing to share their tips and tricks to fellow members as we as the issues that they face in day to day business. Congratulations TNC homes it is a pleasure having you as part of the IBN team and we look forward for many years to come. Congratulation to the crew from TNC Homes! They say “still waters run deep” and never has it been so apt to describe a quiet achiever than to use this phrase when we discuss successful Hamilton Builder, Charles Tapper. Charles has been a member of IBN for over 6-years now and is in to his third term and whilst things had been quiet over the years down Hamilton way, Charles has certainly hit his straps with proactive land development and local networking with NDIS housing providers that he now has had a successful 12-months behind him with further work coming through the new year. Of course this isn’t all Charles’ doing with a very able and hard-working ‘right hand man’ in the office in Traci Schultz who has been by his side throughout the journey and a person we all have almost taken for granted as Traci is always on hand to attend training, communicating on behalf of Charles and following up all of the administrative day to day duties with the same vigour, enthusiasm and diligence that Charles has taken with his business. We were overjoyed to hear in February however, that Charles’ talented daughter Melissa Tapper had received the top award at the VIC Sports Awards by winning the Victorian Female Athlete of the Year. This is in recognition for a sporting lifetime of achieving firsts along with Paralympic and Commonwealth Games’, yes the able-bodied type, Medals! The firsts we speak of was “Milly” becoming the first in Australian history to qualify for both the Olympics and the Paralympics. Melissa has a brachial plexus injury resulting in Erb’s Palsy and through her sporting life has competed against able-bodied athletes since 2002 and has since represented Australia with aplomb and Charles couldn’t be any prouder, now, showcasing his brand on Melissa’s sporting attire as shown in the photo. Tying in with the Independent Builders Network’s Adaptable Living range of homes providing independent living for the ageing, people with a sports injury, the disable or young families, the synergy couldn’t be any better so we congratulate the Team of Traci Schultz, Charles and Melissa “Milly” Tapper for an excellent job and we wish them all heaps of great results from their dedication and hard work in the near future. Congratulations to the crew at Tapper Builders! December 2018 - Brenton & Coby Surrey, BJ & CJ Surrey Builders. It came as absolutely no surprise when the IBN head office team visited Brenton and Coby Surrey on their last day before handover of a unique custom home built on very unfriendly granite in the heart of picturesque Beechworth, to see not just the husband and wife team working fastidiously to ensure a timely handover but to find three generations plus a willing apprentice going for it on a sunny Friday afternoon in late Spring. You see, to keep things in the family and practicing the IBN ethos of sincere family businesses, Coby’s parents Shireen and Paul Brock, were detailing the home as well as son Cooper, trying to do what he could to ensure no stone was left unturned in order to prepare the best new home in town. Surrey Builders have been on a journey with IBN from a very early time in their development as a new home and renovator Builder and in that time Brenton has done some pretty amazing stuff completing a beautiful, cost-effective yet architecturally driven Bed and Breakfast overlooking a vineyard in nearby Stanley, as well as showcasing his construction skills being able to build this current dwelling on total exposed rock, the likes that had not been seen by the IBN Head Office Team in their combined 40-years of Building experience! Obviously, youth was not a precursor to competence nor did it tamper Brenton’s enthusiasm either. The real reason behind this recognition, however, was the social media work that Coby had done for the business and this was highlighted at the recent National IBN Conference held on the Gold Coast where BJ & CJ Surrey Builders were featured as the single most effective IBN Builder out of 100-members who were strategising their social media effectively and totally at the forefront of all other builders, some who had been paying good marketing dollars to professional companies to make their own brand stand out. No, good old-fashioned honest construction, timely handovers, effective communication with clients including those that actually live adjacent to the construction site and making a new brand ambassador in their son “Cowboy Cooper” who definitely has all of the Mums cooing as he is featured consistently in their social media posts and boy, do we love it ourselves! Throw in Coby’s daytime gig working as a support person with the Aboriginal Community in nearby Wangaratta and you truly have a family that is devoted to not only the family business but community spirit. As a footnote we are also proud to see that Brenton has taken on the challenge of learning and implementing the new IBN Adaptable Living style of housing where he will be endeavouring to construct a Silver Level of Liveable Housing Guidelines for Shireen and Paul, and if his recent form is anything to go by, this will no doubt be a home worth Facebooking about! November 2018 - Josh Dawson, JD Construction Mildura. Recently IBN held their Annual National Conference and one of our guest trainers gave a very insightful presentation on continuous innovation and how businesses need to keep challenging themselves to keep growing through getting out of their comfort zones. And in what could almost be called a laggard industry where builders are reluctant to take on new products or methods nor lead the marketplace, it’s refreshing to find a builder who not only dares to be the local innovator but has a dedicated team behind him who relishes in the challenge. The irony was that during the conference whilst the IBN Members were learning about this, our prolific Mildura Builder Josh Dawson was away getting married and actually missed the presentation and JD Construction personifies exactly what the prominent trainer was teaching. It’s for this exact reason why we are awarding for the second time our National Builder of the Month to Josh Dawson and his amazing Team at JD Construction including Laura Milsom for their work in product innovation by being nationally the first to market for the inspiring new IBN Range of Homes, the Adaptable Living Range. Laura had been working with a retired couple - the Millwards - who were wanting to build one of our standard plans being the Koroit which falls in the IBN Homestead Range of house designs. Both the Millwards suffer from arthritis and Mrs Millward was due to have a major back operation so there needed to be an adaption to the design to allow for independent living which IBN and through Laura’s dedicated design work, we were able to adapt the design to suit their needs. During the 2017 IBN Annual Conference where we initiated an imminent launch of the Adaptable Living Range in 2018, Josh identified the need to purpose build a home that would stand up to time and the changes in life of his client and progressed with Laura to build a modified Koroit that met Silver rating under the Livable Housing Guidelines, thus making JD Construction the innovator that IBN needed to drive home the product. At first, the Millwards were a bit sceptical about this and asked their daughter, a nurse, to sit in on a meeting with Laura to discuss the recommended changes. At the end of the meeting the daughter gave the thumbs up on what JD Construction were endeavouring to do for her parents and the contracts were signed. To take the sales service to the next level Laura was asked by Mrs Millward to help her with the colour selection process, so Laura drove around her around Mildura to complete the selections for the house, thus emphasising the reason why our clients choose to deal directly with their local IBN Members. Congratulations to Josh, Laura and the team on taking up Adaptable Living and providing a superior customer service. October 2018 - Paul Crawford, Paul Crawford Builder, Bendigo, Victoria. Every now and then we have a previous winner of the monthly award crop up again for extraordinary reasons as IBN likes to share the love when it comes to giving out gongs to one of the 90+ Builders representing our network throughout Eastern Australia. It’s always a pleasure to nominate our Builders and this month is certainly no exception with one of our longest serving Members who has been with IBN almost longer than any other builder and that is the highly respected and much loved Paul Crawford from Bendigo, located in central Victoria. Whilst IBN was conferencing on the Gold Coast and teaching our Members the best ways to attract interest via their social media, “Crawf” as he is affectionately known, was practising what we were preaching and what had been brought to our attention covertly through his talented Graphic Designer Son, Jesse, Paul had built a home that had his client screaming from the rooftops but of course Paul in his humble nature was not letting on. I don’t think even we could have said it any better nor truer about our Bendigo champion who never fails to deliver and make happy clients. Paul Crawford, the team at IBN, and of course your very happy clients, all salute you on being our October National Builder of the Month! Paul has also become active on Instagram, and you can follow his work here >> Paul's Instagram account. September 2018 - Neville Harte, Neville Harte Builders. We are very excited at the Independent Builders Network Head Office to be able acknowledge one of our most consistent and longest serving Builder Members for the National Builder of the Month Award, which is very highly sought after throughout the 5-states that IBN operates in. Neville, is one of our stalwarts and whilst the very quietly spoken but hands-on Builder may not be a strong name in his home region of Albury-Wodonga on the Victorian-NSW border, he is without doubt very highly rated by the largest local land developer, Nordcon Land, a company itself with a strong link to our Chairman, Kevin Renwick OAM. Through their own CEO, they are encouraging staff to purchase land through the company and build investment properties in this buoyant economy and assist them to help invest in their own future, an amazing support from a local strong Family Business in itself. So when you are the biggest Land Developer in the region and with so many big Builders and franchisees displaying the best on your land you have on-tap a huge list of Builders to choose from in order to provide for your own so who does Nordcon trust above all of these to construct and deliver great new homes with designs suited perfectly for the local market? Nev and his great IBN designs of course! By having access to the IBN unique ranges of home designs Nev has been able to provide cost-effective various offerings suited to get the best out of rental yields on capital growth down the track and Nordcon has recognised this making Nev Harte their “go to” local Builder who they know will be working on site ensuring quality control as well as being competitive through his relationship with the IBN preferred suppliers. For a bloke who you will never hear much about, it’s great to know Nev is recognised as the Builder’s Builder locally and for us at IBN, that’s more important than anything knowing we have not the biggest, but the best Builders in town. Congratulations Nev! You can get in touch with Nev here >> Neville Harte Builder. August 2018 - Mick Egan from MJ Egan PTY LTD, Childers. The Builder Of The Month for August goes to Mick Egan from Childers, a builder who truly personifies what IBN is all about. As Childers is a small regional town, Mick joined IBN to increase his buying power to compete with the project builders that had moved to town and were creating a monopoly in the local area. Mick had previously been a part of a franchise over 20 years ago which is where he first met Kevin Renwick. When Mick heard that Kevin had set up Independent Builders Network, he pretty well joined straight away, knowing how vital it is to have a range of plans to show his clients as well as having the backing of a national network to prove he can be just as competitive as the large project builders. Working with Aaron as a member of the IBN team, they visited all the local real estate agents and developers in the surrounding area looking for ways to generate opportunities. From one of the many meetings came the idea of doing a joint venture with a land developer to do a display home containing the land sales office of the estate. Around nine months later the mayor of the area cut the ribbon at the official opening of the “Abington” Display home. The Abington display is an Adaptable Living, LHA Silver level design which is the first of many displays that will be featuring the Adaptable Living benefits. Mick is truly deserving of this Builder of the month award for going out and creating opportunities to generate sales and following the Kevin Renwick motto of “Making it Happen”. Congratulations to Mick and his team we are looking forward to a very successful display and much more. July 2018 - Clyde Hulme & Li Sun, CH&L Builders, Melbourne East. Continuing the story of smaller local builders being awarded our National Builder of the Month Award, Clyde and Li personify our ethos of perseverance and endeavour as well as total customer satisfaction in looking after their clients. Clyde Hulme and his business partner, Li Sun, were introduced to the Independent Builders Network via incumbent Melbourne Member, Greg Paull from Transform Homes, who themselves were worthy Builder of the Month recipients not so long ago. Clyde runs a dynamic bricklaying team which had serviced high-end custom home builders throughout the Melbourne Eastern and South-eastern region and had good exposure to this exciting industry. Over this period Clyde had Project Managed over 100-houses for various builders and during his formal Building Degree met Li Sun who was also studying to become a fully-fledged builder at the time. Joining forces, Li invested into the bricklaying business, and since then they have grown a formidable team and found IBN to be a perfect fit for their new direction. Executing the Network that’s in our name, Clyde had not only assisted fellow IBN Members with their need for quality tradespeople on site, but he also introduced more potential members to the system. In addition, he also acquainted the IBN Head Office with specialist construction legal representatives who provided professional training and development for IBN’s Victorian members at their latest professional development day, continuing our pursuit of service to our Members and their Clients. Not to rest on any laurels, Clyde had worked at our first Melbourne Home Show in 2018 for four-days straight taking in the challenge of both learning more about IBN and its unique selling benefits as well as supporting other Members and representing the Brand with aplomb. Gaining reward for endeavour Clyde and Li gained work from the Home Show servicing both little jobs that needed professional attention and accurately pricing on larger jobs that required the custom work that only a smaller builder can provide. Li is currently undertaking further studies in Drafting intending to become a qualified Architect so they may jointly enhance the bespoke customer experience in the near future. Clyde and Li will be in attendance at the next Melbourne Home Show running Thursday 16th to Sunday 19th of August, and you can be guaranteed to meet with either of them during the whole duration of the show. We’ve come to take it for granted that both are highly dependable as part of our Melbourne network and IBN very much appreciates the support and effort Li and Clyde put in as do any visitors to the Home Show who may not even be building but needing some honest, professional advice their way. Congratulations to Clyde and Li for achieving what no one has done before, being awarded National IBN Builder of the Month in their first year, this is a massive indication as to the level of gratitude IBN and their Members have towards CH&L Builders. Find out more about CH&L Builders here >> CH&L Builders. Seems that the Kyabram Football Club isn’t the only local on a big roll with the footy side about to create history with the most games won in a row for an Australian Rules side. Local Builder, Jeff & Anthea Howard are one of the Independent Builders Network’s longest-serving members and up until now, have been somewhat of a quiet achiever. But with 8-years under their belt as Members of the Co-operative, Howcon Homes is now certainly racking up the wins! Jeff, who is nearing 40 years in the building industry, has recently had to bring along his son Kane for the ride due to a personal illness. While starting as an apprentice for his father 13 years ago Kane has always aspired to take on a management role with Howcon, however, the need for him to step up so quickly was unexpected, and a structured succession plan was needed. As well as taking on the work out on site, Kane with the help of wife and Mother of two, Laura, have transformed Howcon Homes into a slick marketing machine with a savvy representation on social media. The work of Jeff and Kane has not gone unrecognised with the Independent Builders Network head office acknowledging them with the National Builder of the Month, putting Howcon top of the class in front of 100 other Builder Members. When Jeff suffered his illness and was forced to take 12 months off the tools, he put his energy into an overhaul of the office to showcase the 100+ plans that Howcon had priced and ready to go for any prospective clients who needed a start on choosing a new design. All the while with a little help from those around him, Kane was able to really take the bull by the horns on and off the building site, and together this duo turned Howcon in to a versatile and professionally marketed business which seriously helped when Jeff had recovered from his setback. But it’s not just the Howard team that is doing it on their own, as Kyabram real estate agent McConnell First National has also been integral to the success of Howcon, with Brendan McConnell instigating a successful First Home Buyer information session, upon the pending launch of the new Victorian Regional First Home Owners Boost in mid-2017 and working in closely with Howcon to package fixed priced housing on estates that they market. The night went a long way to explain to prospective and curious First Home Buyers and Parents how the small local Builder is more competitive than the larger out of town mass-marketed volume Builders, through being part of a buying group and offering more suitable plans for a regional area whilst still dealing directly with the Builder still on the tools who is delivering a high standard new home directly for their client. McConnell’s have been marketing two exciting land developments such as The Sunrise Estate in Kyabram developed by another successful Family Business, Vic Property Group run by the Cellante Family as well as their own subdivision at Allan Charlton Drive, Tongala which has launched affordable larger blocks and has quickly been snapped up by shrewd buyers in the region. Now in 2018 after one of the lengthiest membership periods of all IBN Members, Jeff and Kane have more IBN plans being built than ever before and that also includes outside of Tongala and Kyabram with a house soon to be completed in Tatura. So for being one of the best regional family businesses going around, we are proud to award to Jeff, Anthea, Kane and Laura our National Builder of the Month award for June 2018. This month’s Builder of the month award goes to Adam Nielsen from Warwick. Warwick is a regional town that does not have a large project builder franchise - however, the big boys often come in from Toowoomba and snap up all the available work. To combat this, Adam joined IBN so he too, would have the resources and buying power to compete with these “out of towners”. Adam has followed the advice of IBN, advertised locally and branded strongly to show the residents of Warwick that there is now an option to get the benefits of a volume builder (buying power) with the service of a local builder while supporting members of the community. Adam has been able to reduce his build costs and offer a more competitive price by using the IBN suppliers that has seen him win some large builds and set up negotiations with land developers. Congrats Adam and keep up the good work. Second Generation Builders is as the name suggests, a former multi-generational family that certainly lives up to what their name suggests and follows through the promise of what a family business represents, honest dealings, craftsmanship, affordable delivery of product and with a friendly smile that makes you want to have the relationship with Peter & Gina O’Dwyer from Shepparton. Named Second Generation Builders because that is what Peter is after learning the old fashioned way from his Father, Brian, who had been building in the Goulburn Valley area for 50-years! Going through the building industry before power tools were common, Peter learnt the hard way to ensure things were done right the first time and this ensured a professional, competent way of building a home was done in an efficient manner. Pete’s knowledge of the industry and the principles of building means there wasn’t any project he couldn’t handle, using analytical thinking and an absolute passion for creating beautiful buildings in finding solutions for clients that meet their needs. Fast forward in to the exciting new world of social media and instant gratification, Second Generation Builders have been at the forefront of expressing their craftsmanship through multiple social media avenues that are a lesson to fellow builders but it doesn’t come easy. Having attended many training sessions held by the Independent Builders Network over 5-years, both Gina and Peter have somewhat very humbly just kept things simple promoting pretty much what they are doing rather than boasting about their prowess and through the whole network and locally, people are recognising and now trusting the brand they have built being the small builder that cares and gets it right the first time. Peter hasn’t rested on his laurels either and has assisted IBN with travelling to sites in far-flung towns such as Barooga and now Seymour where projects have needed his expertise. One of the most honest Builders you will ever talk to, Pete and Gina have welcomed the opportunity that being members of IBN presents them with by being able to network with fellow members in what can be an isolated existence in the country. They pride themselves on what they have learned at Professional Development Days and ensure both Gina and Pete are in attendance to get the best out of the training. Learning from fellow Members is something they have commented on that they enjoy and through this network it’s also been a great opportunity to make many friends. Gina attributes having access to the IBN array of Plans and the clever website as the best benefit of being a Member of IBN and the virtual tours of display homes and now regular homes is fast becoming a wonderful tool too. Living busy lives themselves, and their clients, means these new ‘power tools’ of the 21st Century is making life easy all round. Jumping on board with the IBN Google Home promotion, Second Generation Builders are offering a complimentary consultation with local Shepparton Clipsal representative, Byers Electrical so if you’re after sophisticated, exciting new automated housing at an affordable price, just find the Shepparton Builder that does it right the first time around. Congratulations Peter & Gina O’Dwyer from Second Generation Builders. One of the best things about being a member of the Independent Builders Network is the opportunity for Builder Members to meet with one another in a non-competitive environment and share ideas, assist each other with problem-solving and generally supporting one another with business opportunities, dealing with suppliers and tradesmen alike. IBN is set up with local zones where members can meet regularly and discuss the above without the fear of exposing trade secrets as the network is made up of like-minded builders who can use the system as a genuine way to compete with the volume builders and beat them at their own game almost like being in a union. These zone meetings are very popular and it with Transform Homes being placed in Melbourne’s North East quadrant, and cover a building territory stretching from the north-west through to the east, Greg Paull has become very popular and is in demand over 3-different zones whom all would like him to attend their own zone meetings as his knowledge of the industry, savvy use of suppliers and pioneering programs are extremely sought after. Transform Homes is managed by Directors, Greg and his business partner, Clive Webster, who between them have over 50-years of Project Management experience as well as accredited skills as Green Living Builders, Accountancy, Commercial Building, Carpentry and even HSSE (Health Safety Security & Environment) Management which has been implemented as part of Transform Homes’ formal business strategy that is followed diligently and results in happy clients around Melbourne. Throw in Greg’s supportive nature towards IBN and their Members and you have one of the most popular Builders within the whole system and with the extremely busy HIA Melbourne Home Show coming up at the Melbourne Convention and Exhibition Centre from Thursday, the 5th of April through to Sunday the 8th, Greg and Clive will be available for a chat over the Thursday and Friday so we suggest Melbourne locals come along and say g’day to these magnificent blokes. We congratulate Transform Homes on their professionalism and exciting delivery of beautiful homes and wish them the best for the rest of 2018. Admittedly Owen McLoughlan had a fair head start when he first joined the Independent Builders Network five years ago. Having been inducted with a Building Franchise that conditioned their members on good marketing and customer control, it was inevitable that OT McLoughlan would fit right in with his fellow members and become a natural leader for all of IBN’s brand traits, particularly Community support, Family Business, Competence and most of all, Network Support to other Members of the IBN. Having taken the gambit with a large push for Community programs way back in 2013, Owen won the IBN first Community Spirit award with his support for the local Cohuna Kangas Football Netball Club and worked towards a referral program that was mutually beneficial for the successful sporting club; and that was done within his first year with IBN! Fast forward to 2018 and we see a wonderful family business that is strongly supported by Kathy Easton, Owen’s Sister, whom has been absolutely paramount to his day to day operations and who also had been available at all training sessions, conferences, zone meetings and one on one training with IBN head office staff for the five years. Unfortunately, during 2017 Kathy contracted Breast Cancer and all of a sudden faced her own challenges which we are more than happy to report, have been addressed through the initial stage of chemotherapy and now is undergoing radiation treatment to hopefully finish off the battle. Kathy has been a pillar of strength and positivity throughout this time and has also been there for others that have also been going through either similar circumstances or others having family or friends needing support. While not entirely out of the woods just yet we are all looking forward to having Kathy back on board and seeing her smiling face will be a welcome return. You see it’s not just OT McLoughlan that has missed Kathy as her pricing system has been shared throughout Victoria as an example to other Members of the Network as to how easy it is to rapid price the amazing array of over 120-IBN Floor Plans throughout the 9-ranges of unique designs that are available to all IBN Members. IBN Head Office have been very appreciative of the work that Kathy has put in over the years, and it is a major part of why OT McLoughlan Construction has been so successful over the years. With Owen very diligent with his duties as the builder of great residential and commercial work, the Family working relationship has shown here in Cohuna, how a cohesive true Family Business should work. Throw in OT McLoughlan programs such as low deposit housing, commercial prowess and even land development and you have a definite versatile business that is made up with the best builders in Cohuna with Colin (cousin), Wade, Shaun & apprentices Cooper (son) & Zac assisting Owen and Kathy to continue to deliver the best. Well done to all of the Team for the great work you have done and good luck Kathy with your successful win against this now all too common blight on our society. With a recent spate of IBN National Builders of the Month being medium to large size providers of homes, it is very exciting to announce our latest addition to the stable is a smaller Builder who personifies the IBN ethos of Family Business and caring for your customer whilst competently taking care of business. A journeyman of sorts, Will Braaksma has travelled around leaving his home in NSW at the age of 17 to work on his apprenticeship in Victoria. Enduring natural growth as a Builder he subcontracted to various companies honing his skills in renovations, extensions, commercial works, houses and apartments and learned multi-skilling with the different challenges offered in each realm. On top of Will’s construction prowess, he completed a diploma in Agribusiness Management and Business Management which also prepared him for life as the successful local Builder, not just a carpenter. One of the things Will witnessed was the larger builders tending to find themselves starting to cut corners and hence having to spend more money fixing up jobs which wasn't an efficient way of going about business. It was with this vision that Will decided he would “leave a mark” and create unique homes and truly give his clients a chance to adore their own abode and on top of that really go the extra mile to make the client happy. It was great timing in 2016 when IBN came along and this gave Will and his wife, Crystal, who runs administration for the business, a chance to take the next step and through their product offerings, give Lifestyle Boutique a chance to compete with the volume builders without losing their unique touch and customer service. One such current story in which we hold so proud for Will is a client who had indeed started building with a larger builder and unfortunately, work had stopped. With a loss of money, no-one seemed to care so Will had stepped in and made this personal, doing everything to help the family of 5 get into their new home and as quickly as possible. The result is more than happy clients and invitations to sporting matches, family events and family meals, obviously a great reward for such customer service and caring attitudes. Continuing the IBN philosophy of helping the next generation, Will has his nephew working with him labouring, and with a family of 3-children, time is also taken for reflection at Church on a Sunday and they work on personal development with local sport and community groups, again the main ethos of the Independent Builders Network Community involvement. Now with the growth coming after initial 18-months with IBN and the opportunities it has given them, The Braaksma family is making a move closer to Melbourne and will soon be opening a showroom in Drouin or Warragul (moving from Thorpedale) and they will continue to deliver unique and affordable homes, no doubt with the Braaksma Customer Service being the number one attraction. Representing the Independent Builders Network (IBN) in our most northern outpost in Townsville, North Queensland, business partners Rob Rule and Cameron McInnes have put a lot of hard work into getting IBN exemplified well there with an amazing display home that they proudly opened in Spring. Reef Coast Constructions consist of former opposing builders Rob and Cameron who combined resources in order to hedge their strengths and continue to deliver optimal customer service as well as still working directly on site maintaining quality control by being on the tools and managing trades accordingly – the ideal IBN Builder! Earlier this year they recruited Peta McDonnell whose Administration skills means everything that needs to be followed up at the office gets handled professionally thanks to her thorough skills. Peta has also maintained the IBN ethos of local community sport involvement by being integral in running the Bindal Sharks All Blacks Rugby League Carnival, a festival of talented Indigenous Australians coming together to compete and enjoy the company of old friends that’s now been going for over 30 years! Whilst not a normal IBN standard design, Rob had worked in closely with Queensland Government developer, Economic Development Queensland (EDQ), in order to have a townhouse designed that fit in with their mantra of delivering affordable smart lots to the Townsville public on land that was developed very close to the city CBD. With this in mind, Rob and Cam then went on a serious campaign to deliver the finest and most exciting product they could and ultimately delivered a display home that certainly had the “wow” factor indeed! This Summer there is a buzz around Townsville that had admittedly been suffering tough times but with an economic boon around the corner and the nearby North Queensland Stadium commencing construction and will be ready to go in time for the Cowboys to continue their great form in the 2020 season. Rob and Cam have timed their run perfectly with teaming up with the EDQ in order to capitalise on the pending surge for the region. The display home, The Fairway, is state of the art and showcases many IBN Supplier unique products such as custom garage storage solutions thanks to Garage King, Clipsal Iconic switches compatible with Bluetooth technology as well as insitu Bluetooth speakers to the well-used outdoor entertaining area, beautifully crafted stone benchtops, outdoor kitchen by Alfresco King and to finish off the golf theme this display home even has its own putting green in order to hone your skills for the nearby Townsville Golf Club! With backing IBN through the tough times and coming out with the transition into a major success story with now the opportunity to grow IBN through to Far North Queensland, we are very proud to award the National Builder for December Award to Rob and Cam of Reef Coast Constructions. As one of our longest serving members, it is no doubt that Considine & Johnston from Leongatha in Victoria’s Southern Gippsland region, is indeed our quietest achiever without question. Tony Smith manages the new homes division of Considine & Johnston which also covers construction in commercial and home improvements. After starting with the company in 1978 and completing his carpentry apprenticeship under Ross Considine and Phillip Johnston, he became a partner in 1983. Since then Tony completed training in Greensmart construction, cost efficient design and has also become registered to build architecturally designed homes so it was no surprise that the similar personality of IBN Builders attracted him to join the network in IBN’s early days. Considine & Johnston through Tony and Home Improvements Manager Gary Sauvarin, also assisted first home buyers to get out of the rent trap through IBN’s low deposit program and added another string to their strong bow of IBN products in order to ensure their clients are given the best customer service and opportunities available. In to its fourth decade now, the Considine & Johnston Trade Golf Day has been a staple in the Leongatha calendar and is very well attended with a huge turnout each year. In addition to raising funds for the local CFA, and over the past three years through the IBN, Clipsal, Vic Properties and Tradelink, has also raised monies for the local Men’s Shed Association which is Australia’s largest male based community development organisation, itself into its 10th year. Tony attended our recent annual conference held in Melbourne where he picked up on the 2018 positioning by IBN to concentrate on Green Housing, National Disability Insurance Scheme (NDIS) qualified Builders as well as offering basic Home Automation to enhance their product offering and this will be rolled out early in the new year. For their community efforts and ongoing support for first home buyers, we are proud to announce Considine & Johnston our National Builder for the month of November. It’s very hard to point out the right person to mention in the title of the Builder of the Month with RMH Homes, as this multi-generational family is made up of an amazing array of the Harrison Family, singling out one name is really not fair when you consider the successful, team orientated nature of this business. The Harrison family are directors Michael and Richard Harrison who take care of on-site works; Valerie and Jacqui Harrison in accounts; and Sharyn Maxwell (nee Harrison) in sales. All are ably assisted by the wonderful Nikita Woods who also does a fantastic job in the office. The past 12 months have seen some amazing results come from moving the business from Mooroolbark to Ferntree Gully where RMH launched the first IBN Melbourne showroom; Michael obtaining accreditation in building Passivhaus - a regimented German rating system that is not only rigorous but a voluntary standard for energy efficiency in construction, reducing ecological footprint and providing ultra-low energy buildings that require little energy for space heating and cooling – and delivering Melbourne’s first fully accredited Passivhaus which saw a successful open day just prior to the recent conference. The home was not only very successfully promoted, but Michael had done such a good job, his client was turned in to an advocate for RMH and the IBN philosophy that architect driven housing should not cost an arm and a leg when we can keep our overheads low whilst participating with a semi-national buying group. It was also very refreshing to see at our recent national conference, the raw expose with father, son and daughter team Richard, Michael and Sharyn. They shared how the family business really operates and let us know that behind the amazingly glossy facade comes hearty debates, some frustrations, a bit of huff and puff but at the end of the day an agreement and movement forward for the business. Being a cornerstone for the whole east of Melbourne making their office our home for the other members that gather monthly there to meet and also utilising the generous offer of sharing the showroom we are all grateful for the great job the Harrison family does for their clients as well as their openness and support of the network. Congratulations to RMH, National Builder of the Month for October 2017. 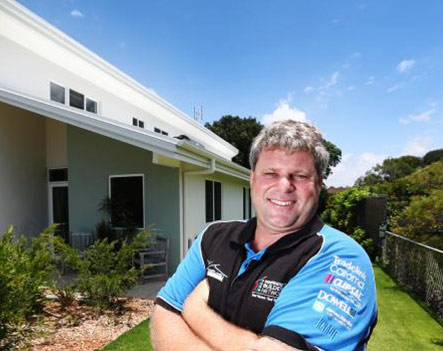 Luke Shephard has seen substantial growth in his business BelCo Constructions in the last year by exploring the investment sales market in the booming Logan area. By utilizing the IBN house and land package service along with a strong commitment to growing his business, Luke has been able to compete with the larger investment sales companies in the area. This is made possible by understanding the market, aligning the inclusions accordingly and by keeping overheads low. Luke has received this award for taking the initiative to adapt his business model to the opportunity’s in the market and implementing the IBN resources to their full potential. It comes as no surprise to those who follow the Independent Builders Network media pages that we are awarding Chris and Anna Owen the National Builder of the Month award for August 2017. Owen Built Homes is a former National Builder of the Year winner with IBN, and since joining the cooperative over five years ago Chris and Anna have enjoyed national awards with us every year of their membership and have definitely not rested on their laurels. Of course, success is not borne out of solo endeavors and the Owen's have an amazing array of talent surrounding them in their beautiful city of Warrnambool in Victoria’s coastal south west, the nursery for southern right whales. Supporting Chris and Anna in the office are the wonderful team of Melissa Rudman, Julie Stephens, Sue Baulch and estimator Aaron Shiells. Ensuring the quality control out on site are Brett Sharp, Brent Chisolm and Sam Coleman who is currently filling a supervisory role in the commercial side of things. In keeping with IBN Members’ trend of mentoring and nurturing of apprentices, Joe Owen-McNeil took out the South West Trades Award in 2016 and shows just how well the Owen's develop their people who are always in attendance at all IBN professional development days. This team has contributed to Owen Built Homes being IBN’s elite Builder over the past five years, and not only has Chris been able to deliver a huge amount of wonderful new homes to many first home buyers but they have also renovated and enhanced the local Mill project which in itself has been nothing short of a remarkable development. Also keeping in with IBN mantra of community support we also enjoy the exciting sponsorship of motor sports through Owen Built which is strongly followed in the region and ensures the Owen Built Homes and IBN Brands are well represented in the field. When Josh Dawson launched his membership with the Independent Builders Network in January 2016 with a huge function held at the Mildura Mercure, we knew we were witnessing something very special and unique to the IBN stable. Fast forward 18 months and it has been a whirlwind period for Josh and his talented team, including Laura Milsom, who have continued to build the presence and the professionalism that is JD Construction Mildura. With a massive team working hard to achieve quality housing, Josh begun his IBN program by starting with the Zero Deposit program which reaped immediate rewards and soon he was on his way. When visiting his first low deposit first home buyers house, IBN National Marketing Manager Tim Renwick commented on how impressive the level of specification was for this product and that he believed Josh had gone above and beyond to complete the specifications for the home to which Josh nonchalantly replied “but that’s what I want to be seen as doing in the local community”. He has continued to over deliver ever since and with the opening of his modern, stylish, captivating new office at 57 Lemon Avenue Mildura, he has now cemented his place with the IBN elite and hence is acknowledged as our National Builder of the Month for July 2017. Of course, Josh doesn’t do this on his own and has an outstanding outfit that has become embedded in the community and recognised with excellence. Along with Laura, there is Wendy Dawson in finance, Anthony Matthews managing projects, Dane Fitzgerald and Jordan White on site assisting with mentoring apprentices Dylan Murphy and Sam Hoyle, as well as Chris Nichols, Brendan Johns, David Aurich and Joel Logan rounding out the team. As our most successful members do, Josh lives a balanced life with his partner Jess Williams and is an impressive footballer, whose career has involved captaining the mighty Mildura Footy Club 2009-2016 and by all accounts, doing pretty good this year so we wish him well. It comes as no surprise that for third time in his tenure as an Independent Builders Network member that the effervescent Dean “DJ” Hogan has managed to be awarded another National Builder of the Month Award! This is no mean feat considering Dean is in a pool of over 100-builders in five states. Dean has again been recognised for his ongoing commitment to professionalism and pursuit of happy handovers with his clients as well as his never-ending support of his fellow IBN Members and highly motivated staff members that he always seems to find. Over the years, Dean has been recognised by industry bodies for his excellence as a builder, but more importantly his insightful recruitment and training of apprentices with not one but two apprentices getting the gong on three occasions with the MBA and with thanks to Dean, have gone on to forge their own paths with trying to become registered builders in their own right. It is personnel management like this that explains why Dean is highly sought after as a local builder in Horsham in Victoria’s Wimmera district, and why the team he surrounds himself with has done such good work in the area. Dean has personified good management skills by getting the best people around him. With a full-time crew out on site including Brad Couch, Dan Nixon, 3rd-year apprentice Josh McPhee, 1st-year apprentice Dylan Rethus, as well as a magnificent office crew including Wendy Aston in sales and Kylie Fielder in accounts. With the IBN ethos of being “Local, Fun and Involved”, DJ Hogan Builders lives and breathes what we are about with his involvement with the Wimmera Machinery Field Days each year, developing land, assisting low deposit First Home Buyers, networking with fellow members and even finding time to take his hard-working team fishing as a reward for a good year’s work and on top of that still manages to take his own boys yabbying when he can and he is not resting there. Dean has ensured he keeps an eye on the future, moving into the dynamic world of social media with attending professional training provided by IBN, “Hoges” is now embarking on the next phase of his business growth. The Independent Builders Network are proud to announce for one more time, that “Hoges” is proudly our National Builder of the Month and wish him every success along with the great team in Horsham. Since joining the Independent Builders Network five years ago in Victoria’s amazingly beautiful town of Bright up on the north-eastern hills, the gateway to the snowfields, Rob Hofbauer of Hofbuild, has done an amazing job in his. Because of the nature of the region, IBN started to develop an Alpine Range of homes for sloping blocks which featured a drying room as their point of difference. Rob assisted IBN with these and through his own development carried out some very good work with the adaptation of Alpine Range homes as well as classy customised split levels to work with the sloping blocks. Working on the premise of the strong relationships with local agents, there has been no better working network in IBN than what Rob has with Gerard Gray from successful local business Dickens Real Estate. Dickens Real Estate not only sell most of the stock in the local area but Gerard actively works in with Rob to ensure the product range is right for the land that they move in Bright, Porepunkah and Myrtleford. Rob has not rested on his packaging either. By following our ethic of local community involvement, Rob is a sponsor of the Alpine Racing Club who run the Tour of Bright which is a major local sporting event over the summer and he also supported Mount Hotham Racing Squad where his son has competed at the highest level – pun intended. Whilst Rob has certainly been somewhat distanced from a proper working zone, recently Kevin has managed to set up a new strong zone with fellow members joining from Beechworth, Wangaratta and Benalla which will ensure the ongoing success for Hofbuild with networking now finally being able to be offered to complete his successful venture into a winning IBN Membership. Congratulations to Rob and the team at Hofbuild. This month's award recognises the leadership and can-do attitude of Kev Morris, chairman of the Independent Builders Network Toowoomba zone. Kev is the perfect example of effective leadership in a zone and how strong communication and motivation can benefit a builder’s business. Due to Kev’s professionally run zone meetings, the members have always been able to obtain some of the most competitive trade pricing seen outside a metro area, proving the strength of networking. Kev does not shy away from the hard topics to be discussed and is always the first to give something a try with his “Gotta be in it to win it attitude”. Whether it is putting his hand up for a spec to grow the zone presence or diving into unknown territory when we first announced our affiliation with Zero Deposit First Homes, Kev is always eager to give it a go. Kev plays a pivotal role in the Toowoomba zone by not only liaising with head office and staff on management decisions but also chairing the zone meetings and being the central point of contact for his fellow display home members. The amount of work Kev puts in both for IBN and for the display does not go unnoticed. Kev is a very worthy winner of the IBN Builder of the Month. Shane Luke Building joined the Independent Builders Network in March 2016 as an already popular and well-respected builder in Echuca located on the NSW/Victoria border. Although the region is highly sought after from local buyers, Shane faced challenges from lack of land being titled. Jumping in warts and all, Shane joined the Zero Deposit launch program in late 2016 with some success even though Land Developers weren’t keen to support due to the already vibrant economy. Shane forged ahead and managed to pick up two jobs with the clients saving their legal costs. As a result, there will be some excited first home buyers obtaining their new homes soon courtesy of Shane’s endeavour. He has also proven to the local Land Developers that we are the real deal indeed. Shane has also availed himself to all training sessions including helping out at the Elmore Field Days which were straight after last year’s conference, and he has already hosted several inter-zone meetings in his most wonderful and beautiful hometown Echuca, an absolute gem on the Victorian border. Well done to Shane and the team at Shane Luke Building on a great job. Keep up the good work! Rhys has been chosen as builder of the month for the exceptional feedback from IBN management and Zero Deposit First Homes around his customer service to clients. Rhys has proven that being persistent and professional with clients gets deals across the line and contracts signed. Rhys has been able to close many deals due to going over and above the normal role of just being a builder, Rhys works with many developers and agents to provide potential clients with a range of land options as part of the “One Build Homes” experience. Congratulations to Rhys and the team at One Build Homes. Congratulations to Mitch Butler from Coastland Builders for winning the January Builder of the month. In addition to this at last year’s conference, Mitch was a part of the #Beard150 which raised thousands of dollars towards a great cause. Well done to Mitch and the team at Coastland Builders. Mitch is currently building our second Sunshine Coast display which will be the Marcoola design. The Marcoola design is a part of our Classique Range which designed for standard blocks and includes some stand out differences from the others. The Master Bedroom at the rear of the design increases privacy, this zoned design allocates the other bedrooms at the front of the design to allow a bit of extra space.